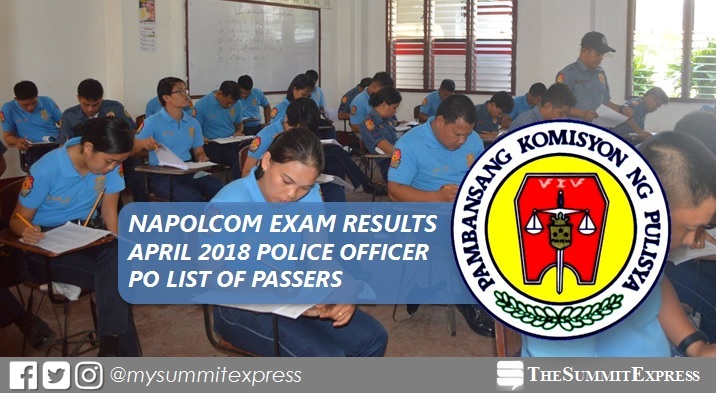 MANILA, Philippines – The National Police Commission releases results of April 2018 NAPOLCOM exam, which include the list of passers for promotional exam categories: Police Officer (PO), Senior Police Officer (SPO), Police Inspector, Superintendent as well as the top 20 passers. NAPOLCOM Vice-Chairman and Executive Officer Atty. Rogelio T. Casurao said that a total of 15,191 candidates took the exam for various promotional test categories. For the PO exams, 2,336 out of 5,554 (42.06%) passed the exams. View on this page for the complete list of passers for Police Officer (PO) examination. The promotional examination is consists of questions on general information, police administration and operations, and police customs and tradition/values and ethical standards. NAPOLCOM also conducted PNP entrance exam to a total of 31,385 aspiring cops. The list of successful examinees will be posted at the NAPOLCOM central office located at the DILG-NAPOLCOM Center, NAPOLCOM Bldg., Edsa Corner Quezon Avenue, West Triangle, Quezon City, and can be viewed at the NAPOLCOM website at www.napolcom.gov.ph. The Summit Express will update this site immediately once results are out online. You may also visit the official website of NAPOLCOM for more information.